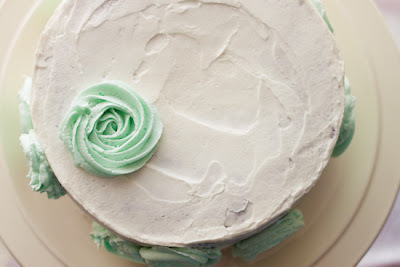 I love to find frosting techniques that look beautiful and intricate, but are actually very easy to create. 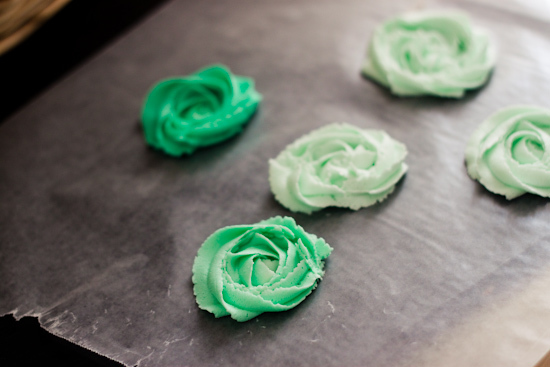 This "rose flower" technique is just like that and has become one of my favorites (you can also find this technique over at I am baker)! 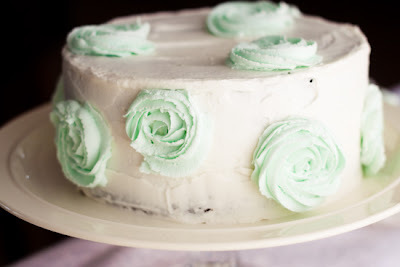 The other day I was able to make a birthday cake for a friend and was so excited to try this technique out! I decided to jazz things up a bit by alternating the flower colors with different hues of teal green. On the way over to the birthday party I realized the cake would have looked awesome if I had some of those long sparkler candles...oh well, maybe next time! Click below for my full tutorial! 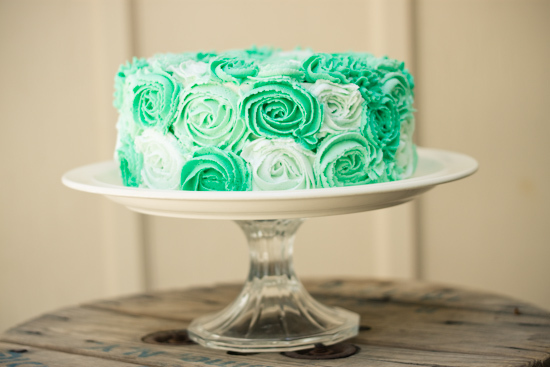 *Note: everything listed is what I used, if you need a larger/smaller cake or want to use a different color you can alter the directions accordingly. 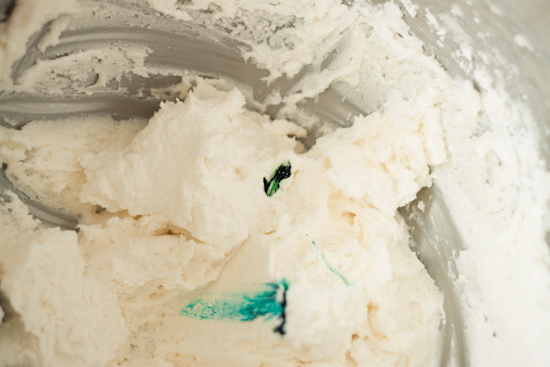 You can also use a whatever buttercream frosting recipe you like! Step 1. 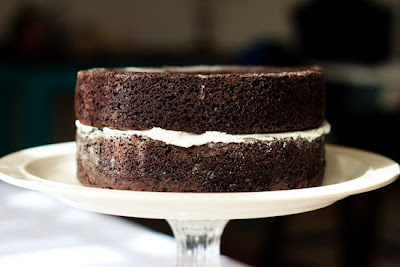 Assemble your two 8" cake rounds on top of each other with a little buttercream frosting or other desired filling between the layers. (refer to my previous cake building post if you need extra help). Step 2. 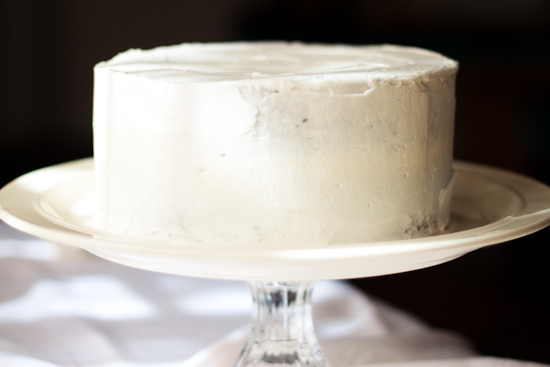 Frost your cake with a thin coat of frosting. It doesn't need to be perfect, no one will notice once your roses are on. Step 3. 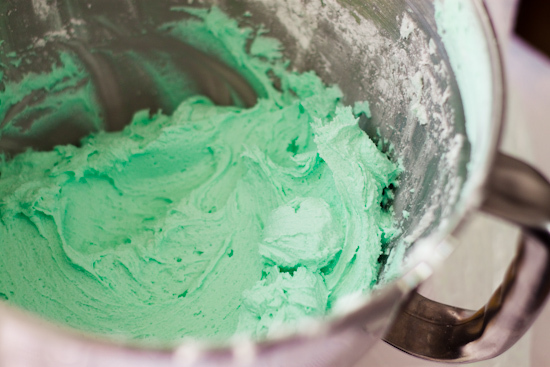 Color your frosting with a dab of blue and green food coloring, or use whatever color you like! 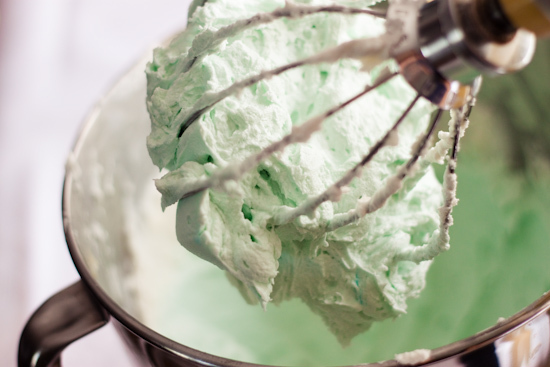 (I prefer Wilton brand food coloring). Step 4. 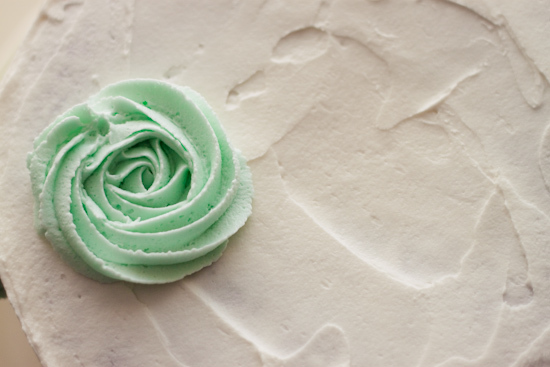 Place your large rose tip into your frosting bag. You can use a coupler too, but I don't have one big enough so I just put my tip directly into the bag. Step 5. 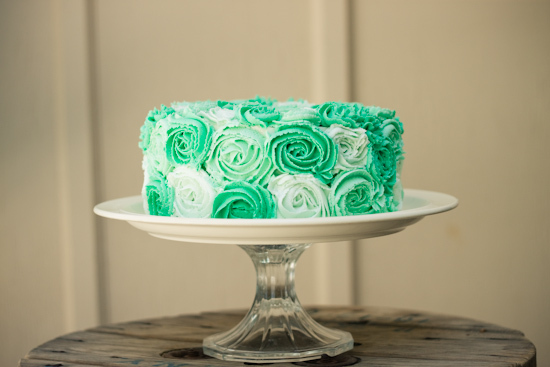 Before you begin to frost your cake, you may want to do a few practice roses. 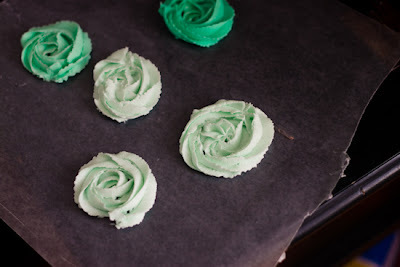 So, tear off a piece of wax paper and try a few roses...Basically you are just making a round swirl by starting in the center and working your way outward. Step 6. 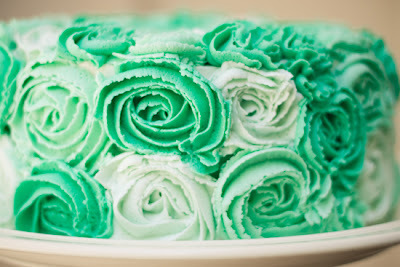 Once you feel like you've got the swirl technique down, start adding roses to your cake. 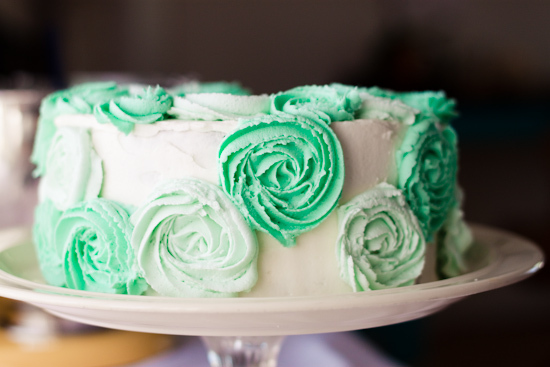 I randomly placed my roses around the top and sides of the cake and also alternated the sizes a little. Step 7. Add a little more food coloring to your frosting to slightly darken the color. Then continue randomly adding flowers around your cake. Step 8. Darken the frosting with a little more food coloring one last time and fill in all remaining holes with roses. If you have any very small leftover spaces, you can fill them in with a small rose/star shape or just leave them blank. Step 9. Eat and enjoy! 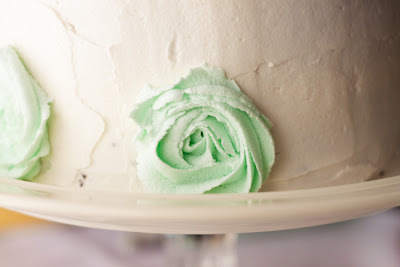 I wish I could have taken a picture of the cake after it was cut because it looks really awesome from the side angle! WOwowow! You are goooood! I am pinning your pretty cake! Oh if you don't have a Pinterest account...I have a link on the right side of my blog. I am soooo trying this! This is SO beautiful! I am so impressed. 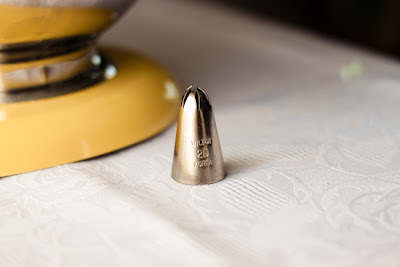 I just found your blog and am enjoying your posts - beautiful pictures and great inspiration! Okay now I feel creepy commenting 3 times..but your cake is a hit on Pinterest! Hope you get some new followers and traffic from it! This is amazing! I love the color variation. Thanks for the tutorial! 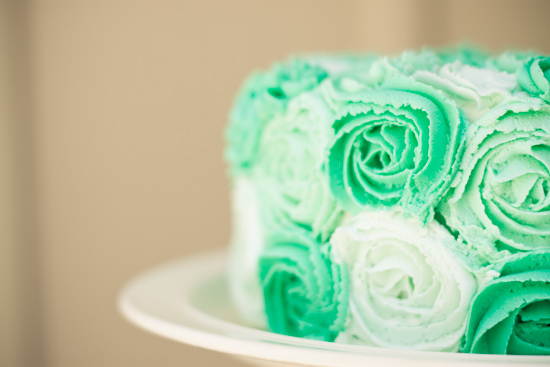 love those colours...buttercream roses are my favourite to make! Wow, what a neat result! I'm definitely going to try this! you make it look too easy :-) gorgeous! Love it! I saw these around before and just couldn't figure out how they were made. Def going to try it out! 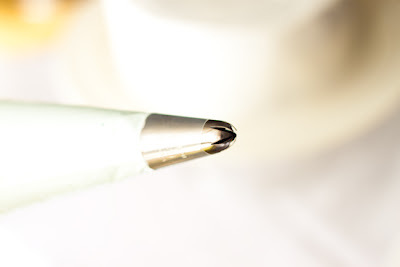 Can you tell us what kind of tip and which brand you are using? It just looks great!! Thanks so much! I'll definitely try this technique soon! gorgeous, can't wait to try this sometime! thanks so much for sharing on Craft Schooling Sunday, and hope you be back again soon! In any case do check back on Sunday to see yourself featured as between this one and the pencils at least one will make it. all the best! Again- LOVE LOVE LOVE IT!! i have commented more on your blog-posts in the past couple of months than on all my other regular ones combined!!! 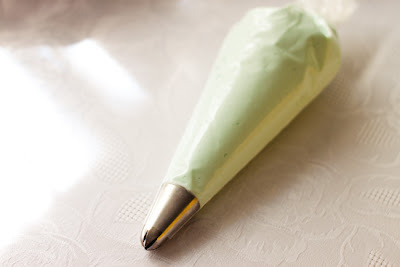 I'm so making this for our next big Sunday Dinner. 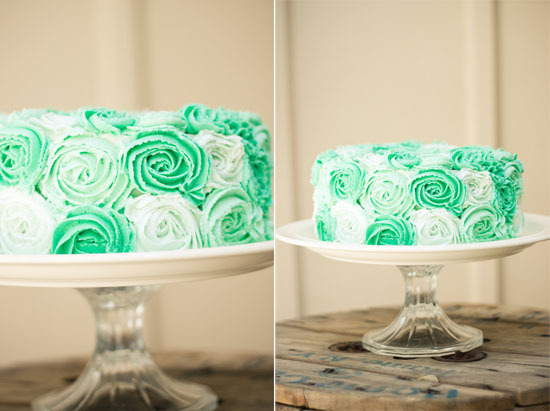 This cake decorating method is TO DIE FOR!!! 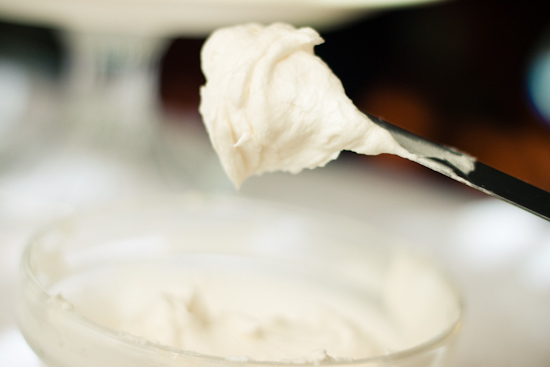 I love it and will be trying it very soon. Thank you for sharing. I really love ur color on the roses. Beautiful creation. loves Katie and I are going to have to try it! 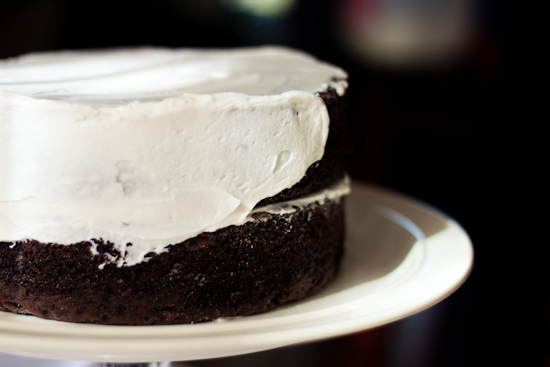 Your cake is beautiful. 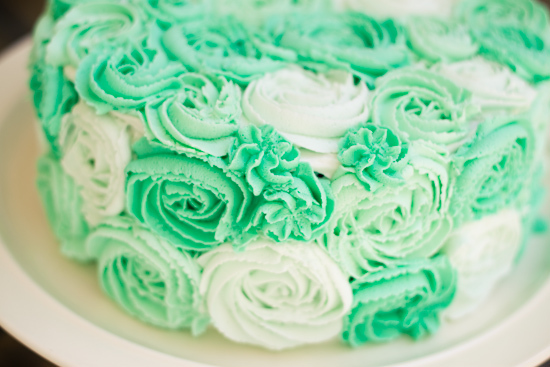 I love how the flowers cover the cake and your photographs are nice. Wow...im not a baker but I absolutely love your creativity. Will need to feature this for my brides. Thanks. I just did this in pink hues and it turned out FABULOUS! Thanks for the pictures, they helped a lot!